Jane B. Hart, an anthropology alumna, generously created an endowment to promote scholarship in anthropology at GW. The money supports a distinguished speakership and two annual awards to undergraduate students: the Hart Award for Outstanding Academic Achievement and the Hart Award for Outstanding Undergraduate Thesis. There is usually one academic achievement award for each of our three major programs (Anthropology, Archaeology, and Biological Anthropology), but two awards are sometimes given. Similarly, there is usually no more than one thesis award per major, but the Hart Award Committee may make multiple awards to equally deserving students. Any faculty member advising an honors thesis may submit a nomination for consideration by the Hart Awards Committee. Nominating is done in the spring, but theses by graduates of the preceding summer and fall are eligible. Theses must be submitted to the Hart Committee by May 1; decisions are usually announced before May 15. (Honors theses not being considered for a Hart Award may be submitted as late as the Friday before graduation). Columbian College is notified of Hart Award winners, and the awards are noted in the students' official records. Academic achievement awards are usually shown in the spring commencement program, but thesis awards are not because they are decided too late in the semester. For their theses to be considered, students must be sure to follow all the guidelines posted under Departmental Honors. Winners of Hart Awards to date are listed below. Jane B. ("Janey") Hart (B.A., Anthropology, 1970) was an accomplished aviator, anti-war activist, and women's rights pioneer. In the early 1960s, she was among a select group of women who were skilled airplane pilots with commercial ratings. A mother of eight and the wife of a U.S. 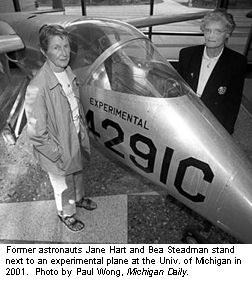 Senator (Philip A. Hart, D-Mich.), Hart was the oldest participant in the Lovelace Foundation's Woman in Space Program, a privately-funded project testing women pilots for astronaut fitness at a time when women were not allowed to become astronauts. She was one of only 13 women (the Mercury 13) to pass the rigorous physical tests developed by NASA to select their astronauts. Despite the test results, NASA notified them by telegram that they would not be selected for space flights. "The men just could not get it and the country lost a great opportunity," she said at the time. As Hart told a group of Michigan college students in 2001, "All of you women engineers would have had a hell of a time trying to find a job back then. It was like they were trying to segregate space." Hart spoke with Vice President Lyndon Johnson and testified before Congress to promote the rights of women to serve as astronauts. In 1964, after Johnson had become President, he named Hart to the newly created Women's Advisory Committee on Aviation. Although she did not travel to space, Hart was among those who paved the way for the first women astronauts and witnessed Lt. Col. Eileen Collins become America's first woman pilot astronaut in 1995. Her opposition to the Vietnam War led to her arrest during an unauthorized Mass for the dead inside the Pentagon in 1969. She also traveled to Hanoi to gain first-hand knowledge of the effects of the air war and meet with American prisoners of war. Hart was a founding member of the National Organization for Women in 1966 and was active in Democratic Party affairs for many years. Born Jane Cameron Briggs, she married the future Sen. Hart when he was an Army captain in World War II. She attended Manhattanville College, but did not complete her bachelor's degree until she came to GW and majored in Anthropology. Hart was a particular friend of Prof. Robert Humphrey. In 2007, Hart was inducted into the Michigan Women's Hall of Fame. She died in 2015 at the age of 93.